1. Boil the sugar with little water to a thick, sticky consistency. 2. Combine all the filling ingredients in a bowl and make small balls of the mixture. 3. In a separate bowl, mix the pastry ingredients with little water to a thick dough consistency. 4. Make small balls and roll them into small puris. 5. Add 1 of the prepared filling ball and fold into a small samosa or into a half-moon shape. 7. Fry the prepared gujiyas till golden brown and remove. 8. Drain excess oil and transfer to a plate. 9. 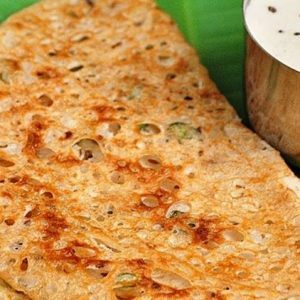 Add 1 tsp of the sugar syrup on top and garnish with kopra or sliced almonds (if desired). 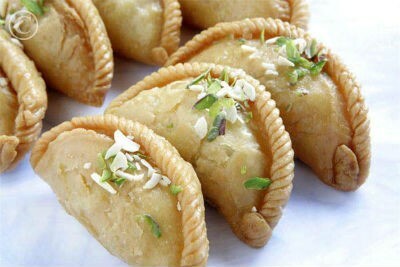 Feel free to comment or share your thoughts on this Maida Gujiya Recipe from Awesome Cuisine.